The rumor mill has once again turned its wheels a few cogs to throw out some new grist for physicists and cosmologists. This is following the announcement last Wednesday of an announcement this Monday in which the Harvard-Smithsonian Center for Astrophysics will reveal to the world a “Major Discovery”. 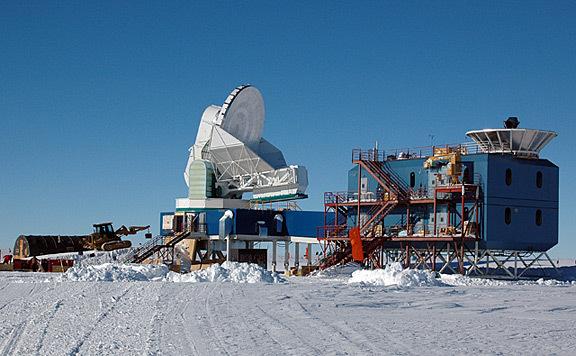 The best available rumours now say that astrophysicsts working with the BICEP observatory in Antartica will reveal the discovery of primordial gravitational waves in the cosmic microwave background. If true this would be a very big deal indeed because it could be a direct experimental hook into the physics of inflation and even quantum gravity. These are of course the least well understood and most exciting unchartered waters of fundamental physics. Any observation that could provide phenomenology for these areas would be the greatest empirical discovery for the foundations of our universe for decades. Before going any further it is worth recalling that we have tuned into some webcast announcements recently only to be disappointed that the expected discovery comes in the form of a negative result setting new limits on what we wanted (e.g. LUX, AMS-2 etc) This could turn out to be another case of the same but if so the “Major Discovery” tag will be pointed out as a major piece of over-hype. It is also possible that the announcement has nothing to do with what the rumors say. but that looks increasingly unlikely at this point. So let’s try to understand a little better what it might be about. The Cosmic Microwave Background has been mapped out in exquisite detail by a series of space and Earth-based observatories including the European Planck mission which provided the best resolution all-sky survey of the CMB. So far Planck has only shown us the fluctuations of the scalar modes but it also looked at the polarisation of the background. Although it stopped working back in 2012 we are still waiting for those maps. Meanwhile some smaller scale results for the polarisation have already come in from land based observatories. Microwave polarisation can be broken down into two modes using a Helmholtz decomposition which splits a vector field into a sum of two parts: The E-mode whose vector curl is zero and the B-mode whose divergence is zero. The E-mode in the CMB was first observed in 2002 by the DASI interferometer, but it is not particularly interesting. E-mode polarisation is generated by scattering from atoms before the radiation decoupled from matter but long after the period of inflation. Last summer the South Pole Telescope (SPT) found B-modes in the CMB for the first time, but these were known to be due to gravitational lensing of the radiation around massive galactic clusters. These can twist the E-mode polarisation to form B-modes so they are only slightly more interesting than the E-modes themselves. Really these lensing B-modes are not much better than a background that needs to be subtracted to see the more interesting B-modes that may be the signature of primordial gravitational waves. The most important thing about a high signal of primordial gravitational waves for now would be that it would show that there is something there that can be measured so more efforts and funding are likely to be turned in that direction. But first the new result (if it is what the rumors say) will be scrutinised, not least by rival astronomers from the SPT and Polarbear observatories who only managed to detect lensing B-modes. Why would BICEP2 succeed where they failed? Can they be sure that they correctly subtracted the background? These questions are premature and even immature before we hear the announcement, but it is good to go along prepared for the kind of questions that may need to be asked. This entry was posted on Saturday, March 15th, 2014 at 1:17 pm and is filed under Cosmology. You can follow any responses to this entry through the RSS 2.0 feed. Both comments and pings are currently closed. 30 Responses to Primordial Gravitational Waves? There’s something I don’t understand: what’s being measured is the tensor-to-scalar ratio, so what’s the link between that and the microwave (ie vector) polarizations? As I understand it the tensor modes (i.e. primordial gravitational waves) will distort the polarization vector field as the CMB passes through space, twisting E-modes into B-modes. So, Monday 17 march, we will learn more about the Big Bang!! We will learn that the inflation epoch of the Cosmos is according standard theory or NOT. Quantum FFF Theory ( Function Follows Form: http://vixra.org/pdf/1308.0083v2.pdf ) says NOT because the big bang is not creating only one big expanding plasma cloud but it is the evaporation and splitting of the huge Big Bang Black Hole into smaller dark matter black holes and the dark energy oscillating Higgs field vacuum. The forest is called the Lyman Alpha forest. Of course, this could also be a major “discovery” similar to OPERA’s superluminal loose-cable neutrinos. But the comments like “because others like POLARBEAR failed, this one must fail too” don’t sound valid to me at all. Both are operating at 150 GHz (2 millimeters wavelength) but POLARBEAR is in Chile, for example, annoyed by the day-night cycles. Ground-based experiments like POLARBEAR and BICEP have lower instrumental noise than Planck and BICEP may apparently get to lower “l” than POLARBEAR (20 vs 30), see e.g. So I don’t think it’s right to throw this announcement away in advance. I have now read numerous papers on the sensitivity of the experiment and others and it looks pretty powerful, e.g. up to 12 times or more times more sensitive than BICEP1 etc. It may very well be a 10-sigma result, like 0.20 plus minus 0.02. The error margin for “r” (T/S) is likely to be 0.03 or lower. They have worked for something like 5 years so I don’t think that the publication of some results would be “hasty” or “premature” now. That doesn’t mean it’s infallible; the probability of an error doesn’t drop to zero after any time. To confirm that the – apparently discovery-like – signal is cosmological, one should probably check that the patterns agree at frequencies different than 150 GHz, so that one more or less excludes some boring astrophysical (and therefore non-black-body) origin. Liam McAllister sort of agreed to write a guest blog right after the event. I view him as a leader of B-modes in stringy cosmology and related issues. I don’t have any preferences, so it’s sort of interesting to think which place I would find intriguing. Like on the exact boundary of the concave and convex? This would be sort of analogous to the “barely unstable” Higgs potential we seem to be seeing, perhaps a hint. Or natural inflation? 10-sigma wow, it gets more exciting. I will look forward to that guest blog for sure. Dear Phil, just to be sure, the 10-sigma scenario is just something I made up as a plausible thing for promotional purposes. It isn’t a part of any rumor I would hear from other sources. But it’s completely conceivable that a “statistical fluke” will be an impossible explanation. Note that some of the dark matter searches have 40 sigma but they’re still not “settled”. Good point about the dark matter thing. There will be much to do before this is settled. After this 15-sigma announcement 🙂 we will need confirmation from somewhere else such as Planck, then the cosmologists need to decide whether the apparently observed B-modes are really a “smoking gun” for inflation or if there are other plausible explanations. Some people like Hooper view the dark matter signal as a sure thing. I surely do believe that he understands these things more than I do and much of my skepticism could be due to the shortage of expertise. Would anyone of you care to elaborate on the implications of this “would-be” finding for B-modes on string cosmology and Quantum Gravity, in general ?. Ervin, that is a very good question. All I am able to say is that there is going to be a lot of talk about it. 1) What physical mechanism lies behind the scale invariance of the CMB anisotropy spectrum? 2) What makes us believe that the GR low-energy description of gravity stays valid all the way up to trans-Plackian scales?. How strong is this assumption when modeling tensorial modes? I wrote the above before seeing Lubos’ post that spells out some of the implications. Thanks! Dear Ervin, we will see where the observation, if any, lands in the graph of “tensor to scalar ratio” r and the spectral index n. It may support some existing models or something else. Chaotic inflation of Linde was disfavored by Planck that suggested a low “r” but BICEP2 may support a higher “r”, perhaps marginally incompatible with the existing Planck papers, which would return Linde’s detailed models to the game. Natural inflation, hilltop quartic model, marginal convex/concave inflation etc. may be supported. Low scale SSB SUSY probably won’t be because it favors a very low “r” and a very low “r” won’t be proven to be nonzero at the discovery level due to the limited accuracy. Each of the model of inflation tends to have some favored stringy compactification. Tomorrow, Prof Liam McAllister of Cornell (a Stanford alumnus etc.) whom I classified as a top string cosmologist (also) working on B-modes should have a guest blog on my blog that should already reflect the announcements. Just to be sure, we are only talking about the “single universe” classical portion of inflation. The announcement, whatever it will be, is unlikely to make the status of the multiverse any clearer. If Phil disagrees, he will hopefully let you know. To some extent, the result would be “quantum gravity” because the modes result from quantum fluctuations of the gravitational field, but the semiclassical (next-to-classical) approximation of QG is enough to explain these things. Oh no, another natural result that the UnNaturalists will have to try to fit into their paradigm. Planck’s mission didn’t end in 2012 as claimed in the post; it worked until October 2013. The coolant for the High Frequency Instrument ran out in January 2012 and for the Low Frequency Instrument later in the year. It was not switched off until October 2013 but its mission was over when those instruments stopped working. The reason SPT and polarbear didn’t detect it is because they are small-area, high-resolution instruments optimized for measuring the lensing signal. BICEP is designed to have sensitivity on large angular scales where the primordial B-mode signal is expected to peak.